Sir Charles Babbage, a British Mathematician has been credited as the first initiator in the evolution of today's computer system, however, the whole idea of the development of the computing machinery has been dated back by many to the time of abacus. Do you remember the history of abacus? It is as old as 3000 BC and was primarily used as a calculating device to aid memory. The first computing machinery built in 1812 by Babbage was a model called the Difference Engine to compute logarithm tables and print the results. He later conceived in 1833 of building a better device capable of performing any calculation such as addition, subtraction, multiplication and division according to instructions coded on cards. This device was called the Analytical Engine which consisted of most features we have in our today's computers. For example, Babbage's Analytical engine could store intermediate results in a memory unit. Though Babbage died before the engine was finally constructed in 1871 by his son, he still has the honour of being called the father of computers till today. It should interest you to know that the first computer program was developed for Babbage's Analytical Engine by Ada Augusta Byron and she is today remembered as the first Computer programmer. Now, the whole history of computers is very loaded but you should know that the development of technology has been closely associated with the evolution of computers. While Babbage machines were mechanical in designs, another computer called the Mark I was one of the first world's electrical computers. Then, there was the ENIAC (Electronic Numerical Integrator And Calculator) which was the first electronic computer built in 1945. The first computer to perform arithmetic and logical operations using a stored-program within it was called the EDSAC (Electronic Delay Storage Automatic Computer). This was followed few months later by EDVAC (Electronic Discrete Automatic Computer). Today's computers are electronic in design. You will now round up this very brief history of computers by knowing that the most early generation computers were developed for scientific and military purposes. The first commercial electronic computer was the UNIVAC I (Universal Automatic Computer). The 1st generation computers used vacuum tubes. The 3rd generation computers used Integrated Circuits (IC's). The 4th generation computers used Large Scale Integrated (LSI) circuits and Very Large Scale Integrated (VLSI) circuits. Today's computers fall within the 4th generation group while the gradually evolving 5th generation computers are those expected to mimic human intelligence. This category of computers specially housed in big buildings are very large and majorly owned by large organizations in the past decades. These are computers next down from mainframes. From the perspective of mainframe computers, they can be properly called medium-sized computers but can perform many of the tasks that mainframes can on a reduced scale. These are the PC's designed to stay in one place, usually on desks or tables. However, you should have seen some types of computer cases being put on the floor, especially the tower style cases. These are portable computers about the size of a notebook and can be placed on your lap while travelling in a bus. Laptop computers are usually powered by rechargeable batteries and due to their great merit of being smaller in size, they are usually expensive. Moreover, it is more expensive to produce Liquid Crystal Display (LCD) used by laptops than the conventional monitor used by desktops. These are the latest and smallest computers available in the market now. As their name implies, you can place them on your palm. With these three parts, you have a complete computer system already to work with. You are now introduced to two main groups of components inside the computer system unit below because of their vital roles. every computer has a motherboard. The most common items on a motherboard are sockets while the remaining circuitry provides interconnections for the essential electronic items, such as the chips or the IC's. The brain of the whole computer system, otherwise known as the CPU (Central Processing Unit), is mounted on the motherboard. The first two drives stated above should normally come with a computer while you need the third one in case you want to access your CD ROM's or play a video CD with your computer. It is good for you to know that some computers can also have Tape Drives. The storage media are usually inserted into and removed from the drives as in floppy and CD drives, for example. They are therefore called Removable Drives. But the Hard disks are permanently fixed in their drives, hence they are called Fixed Disks. LThe most common type of removable drive is the floppy disk drive and you will frequently have to work with this type of drive as you copy files in and out of your computer. The capacity of every drive is measured by the amount of memory space available on the associated storage device. The Central Processing Unit (CPU) is also simply called the Processor and it is the most important component of thecomputer system. Hence it is usually referred to as the Brain or heart of the computer system. The general main function of the CPU is to process instructions. As you can see in the above stated functions of the CPU, the ALU is the component of the CPU that carries out all the calculations. It is therefore called the workhorse of the CPU. The CU part of the CPU operates in what is called "fetch-execute" cycle. This means that instructions are fetched from memory and executed one after the other. The CU mainly oversees the data movement between the ALU and the MM and also between the ALU and other devices of the computer system. The processor cannot generally store all the data it needs while running a program, that is, executing a set of instructions without the aid of memory. Now, you can visualize memory as a series of cells, with each cell having a size for storing a piece of data or information. For the processor to have access to memory, the memory cells must have what we call addresses similar to what we have in the post offices. The smallest unit measurement in the computer memory is the BYTE and 1 BYTE = 8 BITS where a bit is either 0 or 1. The word BIT is obtained from the two words binary digit, which is either 0 or I. You should remember that binary system simply means base two counting system. Now according to how data are accessed in memory, the memory units are classified as RAM and ROM. RAM stands for Random Access Memory. RAM simply means that the cells are organised so that the access time for any cell is the same for any other cell and this is accomplished by arranging the cells in a 2-dimensional array like a spreadsheet. The RAM is volatile, meaning that when the computer is switched off, the contents are lost. The RAM is the workpad of the Computer and the computer Main Memory (MM) is actually your RAM. ROM stands for Read Only Memory and unlike RAM, ROM is non volatile, meaning that its contents cannot be changed. When the computer is switched of the contents of ROM still remain intact. For example, the first information you see on your computer screen anytime you switch on the machine is stored in ROM. There are some variations of RAM and ROM which you may not bother to know about now since they are not common in today's computers. The secondary memory is simply the memory used for permanent storage as opposed to the Main Memory. Examples of secondary memory devices are hard disks, floppy disks and the CD ROM's. Today, you can have a hard disk that is as large as 20GB. You should know that your floppy and hard disks are made of magnetic materials. Hence you should keep them away from magnets and also water so as not to lose the data saved in them. Today too, you can purchase what we call Zip drive disks. These are high capacity secondary storage media and can have memory size as large as 70 floppy disks put together. A terminology used for the combination of the Input and Output devices is called the Transport Devices by some authors. But the common terminology you will frequently see in literature is the I/O (Input/Output) devices. From the above list you can see that the computer is more than a processing tool, but it can be used as a communication tool also, using appropriate devices connected to it with some associated software. Now you will be introduced to some of the input devices. Generally, the input units or devices are used to get commands and data into the computer. These commands or data are sent to the CPU for onward execution or processing respectively. More specifically, commands are the instructions given to the computer to execute while the data are the raw materials you are working on being sent to the computer to process for you as dictated by your requests to the computer. The keyboard is generally called the Standard Input Unit. This is because, it is the input device that must necessarily come with every computer system. You can hardly do without the keyboard despite the development of many input devices today. For example you need the keyboard to type your document which a mouse for example cannot do for you. Today, though there are Voice recognition software to use by just speaking into a microphone to see your voice translated into letters on the screen, the key board still remains the standard input device. However, before you learn more about the Keyboard, it is good to know that the keyboard is said to be "typematic", meaning that if you keep your any key pressed beyond a single stroke, the key will keep on repeating itself such as what follows “SSSSSSSSSSSSSSSS", for pressing S key for some seconds. So you need to be smart, soft and brief when pressing your keyboard keys! Due to the influence of the typewriter, the layout of most electronic keyboards closely follow that of the QWERTY keyboard. Remember that the word Qwerty is simply the order of characters on the back row of keys (from left to right) on a manual typewriter. This layout was used in the design of the English Language Computer Keyboard, possibly to avoid re-training our typists. As you can see, the Editing Keys consist of the character keys, Numeric Keys on the second row and some keys associated with text inputs. Now, apart from the Numeric, Alphabetic and Punctuation Keys, let us study more closely some other keys associated with editing. When you press the Caps Lock key, an indicator light is on at the top right corner of the keyboard and any character you type in this mode will be a capital letter. This is an essential key you might use more frequently than any other key. On some keyboards, you can identify it with symbol. The Enter Key is also called the Return Key in the older design of electronic keyboards because it plays the role of the carriage Return of the manual typewriter. Enter Key is used to end the current line of the text and start a new one when typing. However, the Enter Key can also be used to run a program whose icon is already selected or whose associated button is highlighted. You will get to know more of its uses in other environments ahead. This key creates a space character. However, watch out, it deletes a character to the right if the insert key is off. With Insert Key on, it simply creates space between two character5, that is, it shift5 forward to the right of the next character. You can also use it to execute an action whose associated button is highlighted. This key is used to indent your text as used in paragraphing, when typing as you will see later, it is also used to change an object, especially text, in dialog boxes. This longest key on the computer keyborad. The backspace Key is identified on the keyboard by the Left-Arrow Key on some Keyboards. Is is used to delete a character to the left of the insertion point. This is to help you to correct possibly a wrongly typed character. Do you have this features on a manual typewriter? No. These are the keys labeled F1, F2, and F12 on the first row of your keyboard. The use of any of these keys depends on the software you are using. The keys are usually programmed to carry out a number of steps in one single step. However, programmers are united in programming F1 Key to open for you a help window, where available. These are the cursor-control keys that help you to move around on the screen. They are four in number, identified by the Left, Right, up and Down arrows. A group of these keys are also on the Numeric Keypad but your Num Lock key must be in "off' mode to use them lest you seefor example number "8" typed on your screen when you intend to move upward. As you can see, the Numeric Keypad appears like a simple calculator. It is mainly useful when you have to enter repeatedly numbers. You should normally press the Num Lock key with the Num Lock Indicator light on, when you want to use the number keys of the keypad. There are two keys labeled Ctrl and another two labeled Alt on the keyboard. These two types of keys are normally used in combination with other keys to perform a task. You can therefore see them as "Modifiers" i.e. they modify the default or the original function of another key. Their uses depend on different programs. For example, if you press Ctrl + S. that is Ctrl key with S key together in Microsoft Word environment, the action will amount to saving your current document. However, it is a general fact that if you press the following combination of keys: Ctrl + Alt + Del, your computer system will reboot itself. This key is often used to go back one step or cancel the current command. Hence, its use is also dependent on different programs. The windows key was introduced few years ago because of the influence of the windows operating system. The Windows key has the window logo and it is used to activate or simulate the start button on the taskbar, instead of using the Mouse. The shortcut key is also called the popup key. It is simply activated on the screen some menu items associated with your current activity window or selected object. What a funny name for the device!. The name has not changed though technology has changed its design from the old mouse-like look of many decades ago. At the bottom of the Mouse is a ball which should be kept clean always, hence you need to use a Mouse Pad to prevent it from gathering dust. The mouse is a member of the group called Pointing Devices. They are called Pointing devices because they are used to move pointers on the computer screen to desired positions. They are therefore Positioning devices. The pointers can have various shapes depending on your environment. As you are going to see later, the pointer can be a vertical I symbol on your Word Processing window. The key can be configured for left-handed users so that the primary and Secondary keys are reversed. The Secondary key gives you access to some menus that are related to what you may want to do with what you currently have on your screen or the item you have currently selected on the screen. Selecting an item is also called Highlighting in some cases. This is done by moving the Mouse so that the Pointer is positioned on a specific icon on the screen or an item of menus. This is the pressing gently of either the Primary or the Secondary button. Except you configure your desktop to be like a Web page, a single click of the primary button is done to select an item. However, if you configure your desktop as a web page, a single click will perform a task as if you are double-clicking. This is the fast tapping of the primary button TWICE. It is usually done to run a program associated with a selected icon or to open a window. Remember that if your desktop is customized as a web page, a single click will do the job.You need to know that Double-clicking a word in Microsoft Word will select the word while triple-clicking will select the whole paragraph. Dragging is the use of the Mouse to move around a window object or a group of objects. To carry out dragging, you select the object and thenhold down the Primary button while you move the object to your desired position.Finally, you need to practice to become an effective user of the Mouse. Joysticks are also input devices specifically used for some computer games. They are of different designs and colours. Why do you think we have to classify a scanner as an input device? This is simply because the scanner has to transfer the scanned image to your computer screen for you to see before saving the image or printing it out. However, most scanners are Flatbed scanners, having a photocopier design. Most scanners have the ability to convert your text image into actual text, so that you don't have to type all over again a page of document. This special feature is called Optical Character Recognition (OCR). However, you may not have 100% conversion of the characters for some scanners. That means that you have to do some editing of the scanned text. Technology has made life so easy for keeping records of your memorable events on the computer using a digital camera. The digital camera doesn't use films as in conventional camera. The camera simply digitizes the image captured (i.e. converting them to dots with the appropriate colours) and them keeps the image in its memory until you transfer it to your computer via a cable. This is also an input device that records your voice data to the computer. It can also be used to record songs if you like with an appropriate software to do the recording and play it back when you so wish. Today, you can send your voice message as a computer file through a computer to a distant friend. The receiver can then play it on his own computer. For example, a voice message can be attached to an email to be sent to a friend in a far away country instead of paying so much to talk to him on phone. Moreover, there are many Voice Recognition software today that can record your voice and translate it into characters on the screen. The device that helps you to do all these is a Microphone connected to the appropriate socket on your computer system. On the left is an example of a Voice Dictation session. However the computer couldn't translate my words correctly because of my phonetics. You need to train your voice to be able to receive the best results in Voice Recognition dictation. You also need to configure the device appropriately and be in an environment without noise because the computer can translate the noise as part of your voice! Have you heard of Video Conferencing?. This is using your computer to participate in discussion with a group of people in a distant place. You need a microphone to transmit your voice across to the members of the "Invisible Conference", where you only see your fellow conference members on your computer screen. The most common display device is the MONITOR. In fact you should know that the Monitor is called the Standard Output Unit while the Keyboard is the Standard Input Unit. This is because it provides the immediate output you need from a computer processing unit. 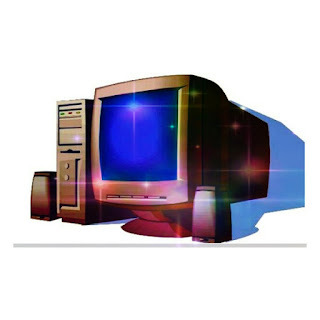 The monitor uses the same Cathode Ray Tube (CRT) like the television set. May be you have heard of 14" Monitor. the CRT are usually manufactured in different sizes. This gives the size of a monitor and it is the measurement of the diagonal across the picture tube for example from the top left to the bottom right or from the top right to the bottom left. These are the commonly used display devices you see with laptop computers. Remember, LCD stands for Liquid Crystal Display and this type of display emit no radiation unlike monitors. This makes it very advantageous. Moreover, LCD panels are flat in shape and thereby reducing desk space when used with desktop computers. These are fast disappearing from the market because of the advancement of technology that has given rise to Inkjet and Laser Jet printers. Dot Matrix printers belong to the group of Impact Printers because the Print head has to hit the paper and make some impact on the ribbon before the printing process is complete can appear on the paper. Hence they are useful when you have to print on cyclostyling stencils toproduce large quantities of your printouts. Many organizations in Nigeria for example still use this type of printers to print their monthly staff Pay Slips, because of the high cost of printing so many of them using other types of printers. These are Non-Impact printers. They print almost noiselessly, because of their design to use ink (for Inkjet) and toner (for Laser Jet). Laser Jet and Ink Jet printers have better Resolution than Dot Matrix printers. Resolution is the number of dots per inch (dpi). Printing with a Laser Jet printer is like having your final printed outputs look exactly as if they were produced from a printing house. This uses the same process like that of the Photocopiers. An Ink Jet Printer output can produce some blots if you rub your hand on the paper the moment it comes out of the printer. You allow somejust as theseconds to allow you get the printed materials from an Ink Jet Printer to dry up. They are today the most expensive types of printers in themarket. They can print your outputs in colours as they appear on the screen. There are Colour Laser Jet Printers too, but very expensive. These are simply the Speakers that come with your multimedia pack soas to get sound or voice output out of your computer system. You need speakers to play an audio file for example. Many electronic tutorials today include sound components and speakers are essential to fully go through such tutorials with full understanding. 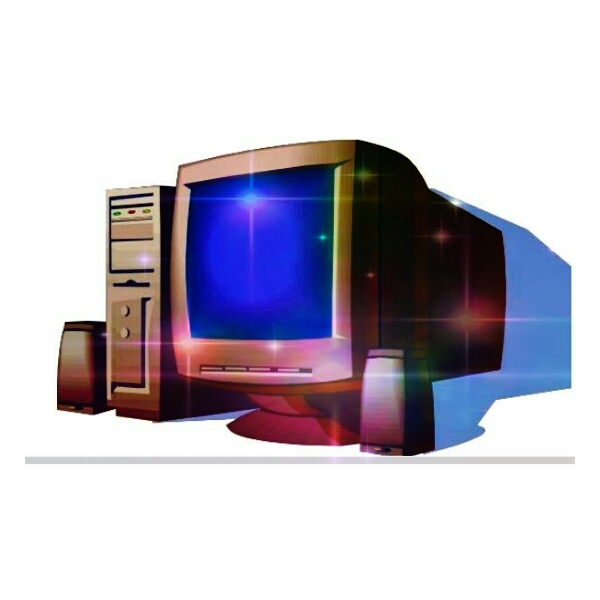 You can receive Radio and Television channel signals on your computer by having an appropriate communication device installed. But you need speakersconnected to output the sound effects. The Multimedia speakers areusually similar to some types of desk speakers used by some stereosets. However, there is a small speaker that is usually fixed inside thesystem unit to give some error alarms such as when a wrong key is pressed on a keyboard. You have been introduced to the brief history of computers and also have learnt a number of basic features of the computer system. You have learnt for example, the basic components of computer system. Some of these components are not directly visible to you since they are inside the system unit, but some can be handled by you such as the floppy disk. More so, you have learnt about the various groupings of the keyboard keys and the basic operation of the keys. Remember, the keyboard still remains the standard input device and you need to get used to the keys. I have also taken you through the use of the mouse as a very important input device within windows environment. You have equally learnt in this composition about the various types of memory the computer uses. For example you have to remember to save your work always since what you see on the screen are temporarily kept in RAM and the moment you switch off the computer, they are gone. You have also learnt about the Computer peripherals and that they are classified as Input, Output, Storage and Communication devices. These are the common devices that make the computer a complete useful tool. You will be using most of these devices in your frequent use of the computer machine to perform one task or the other. Introduction to Personal Computers, 1992. Information Age, Delmar Publishers Inc., 1986. Applications), Third Edition, West Publishing Company, 1985.